A compendium from a range of sources covering over 100 nosode and sarcode remedies. Nosodes and Sarcodes have a special place in our homeopathic materia medica and therapeutics where one road ends but they show another path which can lead to recovery. 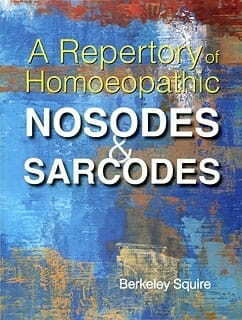 This is the first detailed repertory of the homeopathic nosodes and sarcodes. The purpose of this book is to visualize the characteristic symptoms of nosodes and sarcodes in concise and practical form for easy comprehension. It is an excellent scientific approach to the important study of nosodes and sarcodes.